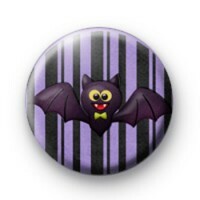 A purple bat button badge for Halloween with a super cute illustration of a cartoon bat wearing a green bow tie. A purple and black striped background sets this spooky badge of nicely and the super cute bat makes this an adorable Halloween badge. We have a great range of Halloween 25mm button badges on the website in our Halloween badge section, so be sure to browse our Halloween badges and stock up in time for October 31st. 25mm badge handmade in the UK.